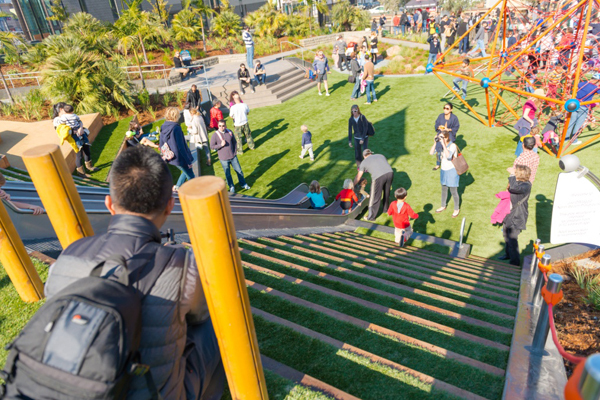 The CPSC Public Playground Safety Handbook defines an embankment slide as a slide that follows the contour of the ground and at no point is the bottom of the chute greater than 12 inches above the surrounding ground (see Section 5.3.6.3.1. Embankment slides on pages 33-35). If this requirement is met, the length of the slide bedway does not require protective surfacing beneath it, allowing a designer to plant vegetation or design steps along the hillside. However, if the distance from the chute to the ground exceeds 12 inches, then it is considered an elevated hillslide and protective surfacing is required. It is also a requirement to have a protective area at the exit of the chute. A hillslide typically needs a hill, but not every park has this luxury. 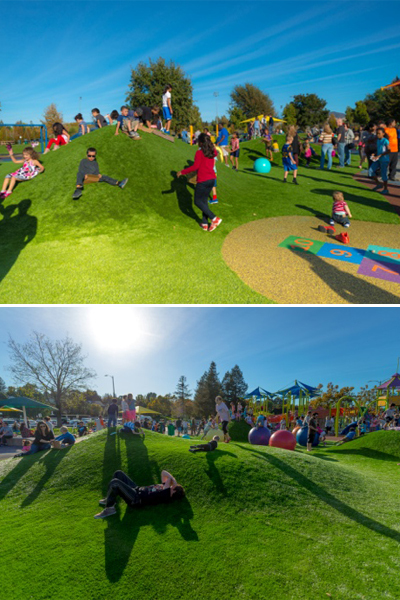 If your site does not naturally include grade changes, introducing topography into your design also adds another dimension of play value that cannot be accomplished by manufactured playground equipment alone. 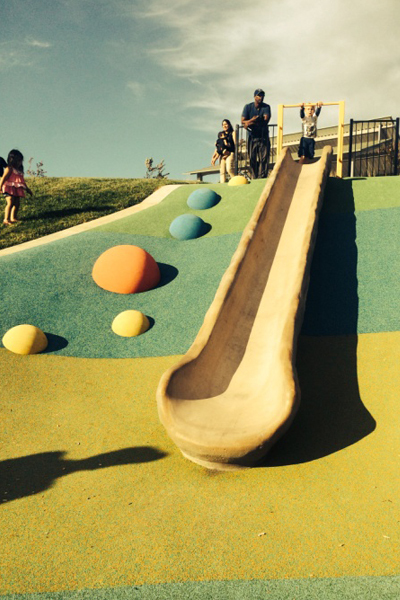 Mounding with surfacing is a versatile approach to playscape design and can be introduced in most locations. This can be accomplished with the use of a foam base, compacted baserock, or by creating a series of retaining walls or stacked stone to create a hillside, as in Lafayette Park in San Francisco. If you are fortunate to have elevations within your site, congratulations—you are one step closer to designing an embankment slide. However, we have found that using the natural topography for embankment slides is rarely successful without some modification. Embankment slides not only have to have a specific slope in order to be compliant, but they also need to have a certain slope to make them fun. The target angle for fun and safety is between 30-45 degrees. 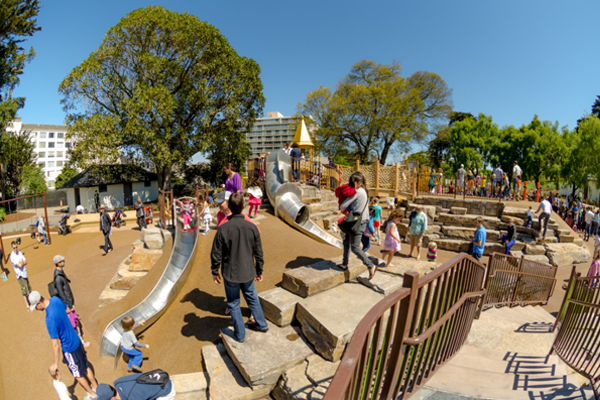 According to the CPSC Playground Safety Handbook and ASTM F1487-11, an embankment slide should be designed to an average angle of 30 degrees and it must not exceed 50 degrees at any point. The material of the slide is also something important to keep in mind. Here we address the pros and cons of a number of material choices. 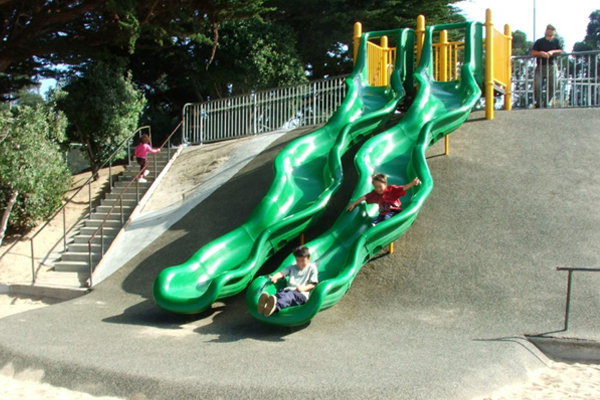 Miracle Recreation manufactures a chameleon slide which is a cost effective solution and can be designed in a series of twists and turns to create a dynamic sliding experience that can be extended for long hillsides. 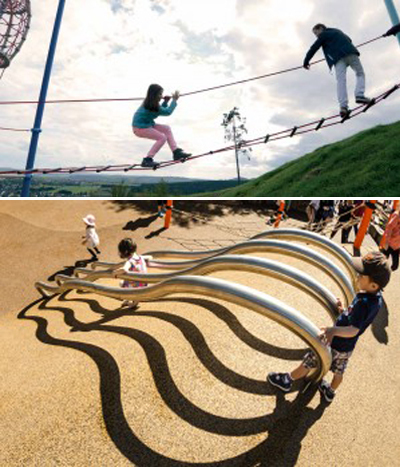 A drawback of plastic slides is the static generated while sliding on plastic makes it a non-ideal choice when designing a play area for children of all abilities. The static generated from plastic slides interferes with cochlear implants and should not be a first choice when considering an all inclusive design. The embankment slides of the 70’s were often poured on-site and made of a coarse concrete. Kids would ride down on a cardboard box or wax paper in order to make it slicker. 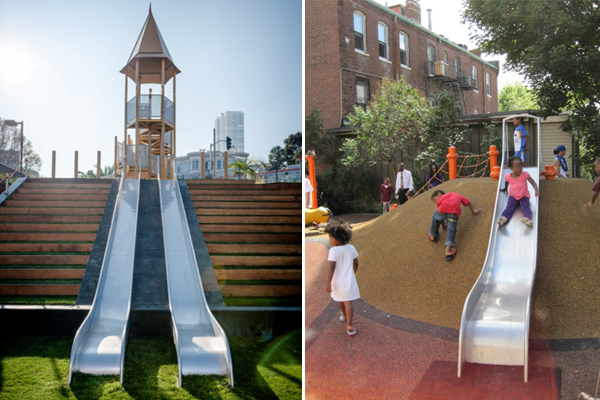 Today’s playground manufacturers have been able to prefabricate slides that don’t require that approach. Manufacturers such as UPC Rocks and Ropes make custom concrete hill slides that are made out of a smooth polished concrete. The bedways are slick and never require additional polishing. Berliner manufactures steel slides that can also be customized to your design inspiration. Steel should only be considered in cooler regions or in shaded areas. Positioning these slides in a north-facing orientation also helps to keep them cool. Ordering an “off the shelf” slide, and relying on your installer to “make it work” on site, is rarely a successful approach. 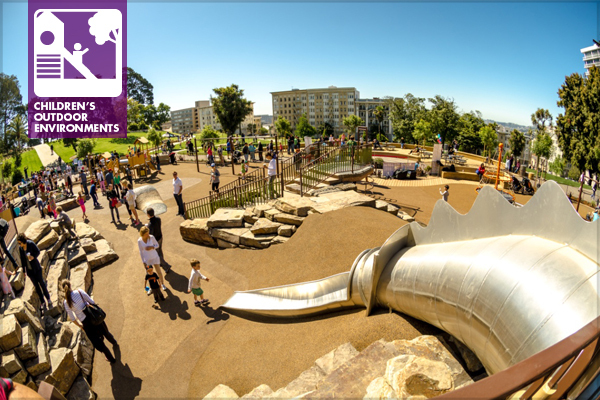 Bringing the designer, slide manufacturer, playground safety inspector, and installer together at an early stage is a huge key to a successful result. The diagram below shows a UPC Rocks and Ropes embankment slide. The slope of the slide is 30 degrees. The slide comes in one piece and is mounted onsite to a footing at the top of the slide. The slide exit has an integral footing. In order for this to be useful, it is important to know the ASTM and CPSC’s requirements for slides, which state that the chute should have sides that are a minimum of 4 inches high along both sides of the chute and extending the entire length of the inclined sliding surface. These sides should be an integral part of the slide and there should be no gaps between the sides and the sliding surface. 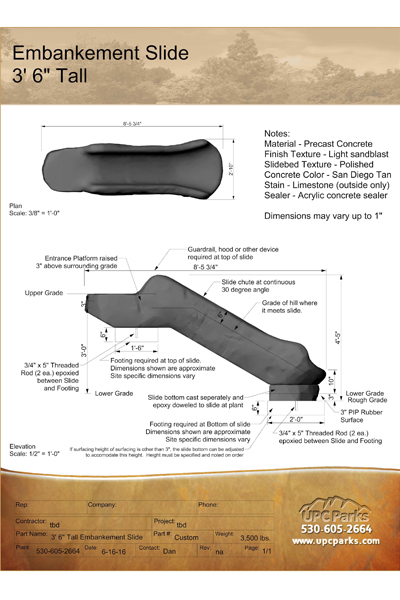 There are also specifics about the radius of the slide chute and required clearances that should be carefully reviewed when locating and manufacturing a custom embankment slide. Looking again to the CPSC Public Playground Safety Handbook, “There should be some means provided at the slide chute entrance to minimize the use of embankment slides by children on skates, skateboards, or bicycles.” This requirement is important for the safety of all park users. This can be integral to the slide or accomplished by providing an access bar that is mounted over the slide entrance, as seen at the concrete slide in Hillside Park, above. This bar can prevent a user from accidentally falling down the chute and it also helps position a child in the forward facing sliding position. 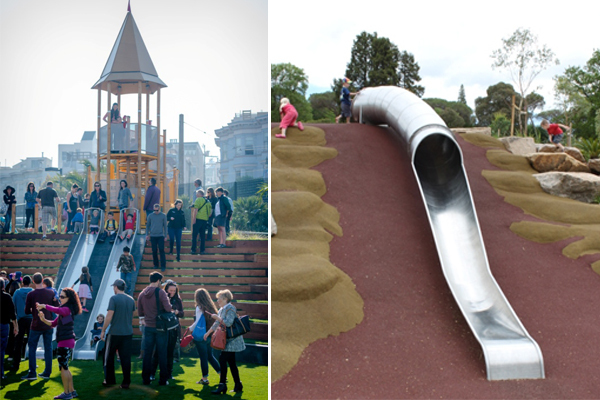 If embankment slides are not the perfect fit for your site or you want to include other play opportunities along with your embankment slide, there are a wide variety of hillside play events available. Terranos and Terranova lines by Berliner are customizeable nets designed for climbing the slope of any topography and can be customized for a site-specific design. Kids can crawl under it or over it to get to the top of the hill. White Water are a series of rails that can be used for sliding back down. Next Article When Did Scenic Quality Stop Mattering? I would love to see a section of a constructed hill as you mention with a foam base! Cheryl@cherylcorson.com. Thanks!